At PIZZA D'OH! we take pride in the product we source. We get great stuff from all sorts of places, some local to the Mornington Peninsula, other great Australian products and of course the very special air freighted things we get from Italy. We feature a product each month that you can purchase from us to use at home. The product features on our daily specials, recipes and ideas for the product will be on the website. PIZZA D'OH! 's own gourmet food label! 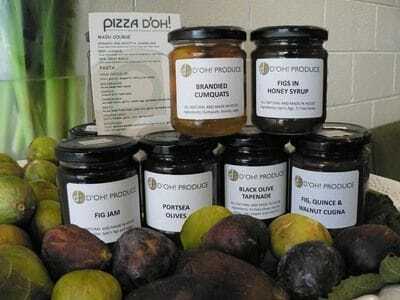 We use local Mornington Peninsula produce to create a variety of jams, chutneys, marinated olives, our selection of extra virgin olive oil, pasta sauces and more. These products come and go according to availability. At PIZZA D'OH! we are currently working on a range of kitchen clothing, caps, tea towels and other great stuff so you can remember your visit to the Mornington Peninsula. The ideal gift for someone who has everything! !